Want to lower your risk for breast cancer, maintain a healthy weight, and stay satisfied? You can! The secret is to toss out the unhealthy fats (like vegetable oil, corn, canola oil and soybean oil) and replace them with more nourishing oils full of anti-inflammatory and cancer-fighting compounds. 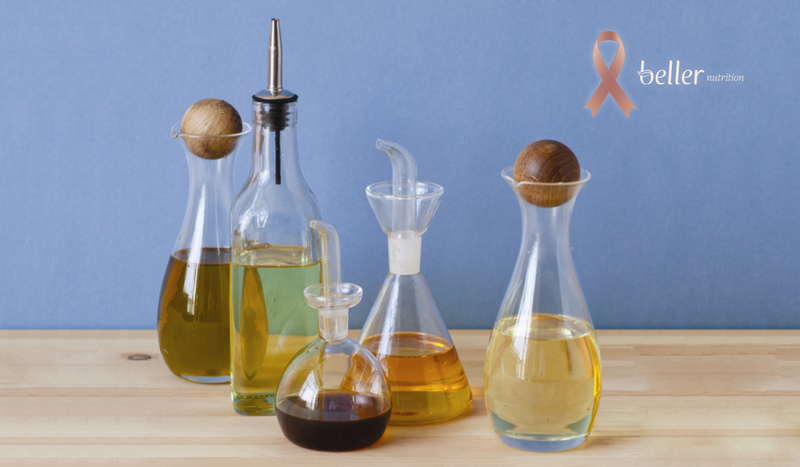 Check out this handy list to learn which oils you should add to your anti-cancer Power Pantry! Why it’s great: A pure, flavorful oil with a low smoke point. It has at least 30 plant-based chemicals which account for its antioxidant, anti-inflammatory, and potential anti-cancer effects. Why it’s great: Slightly less flavorful than cold-pressed olive oil, but refining gives this oil a higher smoke point (meaning you can heat it up)! How to use it: Used for high heat cooking and searing. How to use it: Drizzled over cold dishes or gently sauteed veggies. Why it’s great: Nuts are an amazing source of anti-inflammatory Omega-3 oils and fiber – both of which may help reduce your risk of breast cancer. They also add a delightful crunch to any dish. How to use it: raw or lightly toasted. Great on salads and grain bowls! Bonus Tip: Tired of messy oil spills? I recommend using a ‘misto’ oil sprayer, which evenly coats food with oil. The mister is environmentally friendly, easy to use and keeps the kitchen tidy! Start using these awesome oils in your favorite dishes ASAP! I recommend sticking to about 1 tablespoon of oil OR 2 tablespoons of nuts per meal for easy, waist friendly portion control. You’ll be amazed at how delicious breast-cancer prevention can be.